Equator Coffees & Teas is one of the true pioneers of coffee’s third wave. 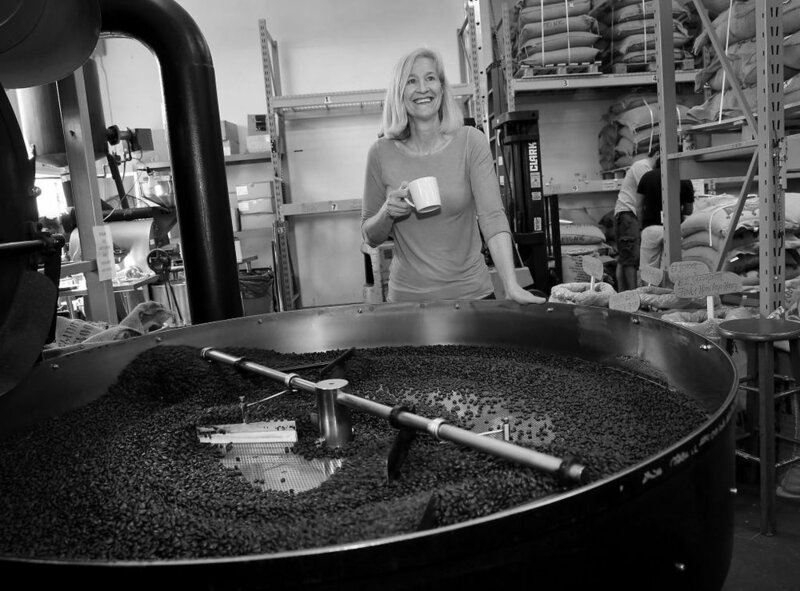 Since the mid-90s, Brooke McDonnell and her partner and co-founder Helen Russell have been a driving force in the growth and development of the Bay Area’s coffee scene, from humble origins roasting in a garage in San Francisco to a B Corporation with seven cafes and an extensive list of wholesale clients (including Google and Twitter). Equator’s approach is truly admirable—the company is focused on fair pay and inclusiveness at origin, social and environmental stewardship, and the well-being of its staff, and they have been successful while sticking to these principles. Brooke was kind enough to talk with me via email—the time difference and her busy schedule made this the easiest option—about coffee roasting, delving into farming and her hopes for the future of Equator. Do you have a foundational coffee experience? For a coffee careerist, little can compete with the emotional power of that first farm or co-op visit. In 1997, it was the first year of the peace in Guatemala and I went to visit a producer in Pochuta with a naive, romantic notion of the coffee I was roasting—gems from distant lands! Armed teenage militias were everywhere stopping travelers on the roads and some tense moments ensued. That visit, the farm, the mill the indigenous community connected me to something much larger and gave me a sense that what I did mattered. What drew you to roasting? Temperament. Roasting is a solitary process-driven role—perfect for those like myself who tend to be creative, contemplative and not averse to its physical demands. There was a mystique surrounding this aspect of coffee back then and not much information. The spirit of discovery loomed large over the craft. Has your roasting philosophy changed since you began? When we started wholesale roasting in 1995 (we did not add retail until our first Equator store in 2013), most of our customers, including us, had come of age during the dark roast era of coffee and it was just a matter of calibrating degree of development beyond second crack. Only 10% of our customers were willing to try a lighter roast despite coaxing. Thankfully, that all changed about 15 years ago when a small band of retailers threw down the gauntlet and said "thus far and no farther"—only light roast coffees will be served! The age of showcasing the effects of terroir and milling on coffee had arrived. In 1992, we (Helen Russell and myself) spent several weeks in Portland, Oregon. Our mornings started at a Starbucks kiosk in Pioneer Square. We became obsessed with the coffee kiosk concept and decided to try something similar in San Francisco. This was the nascent stage of specialty coffee's emergence and not much was happening in the Bay Area with coffee. Over the next year we had two coffee carts built and opened one near the base of Market Street, San Francisco, and the other near Lake Merritt in Oakland. We leased our storage commissary space in buildings and operated the carts outside their entrances. All sorts of weather made the cart experience a tough initiation into coffee, but they did well and we sold them after a couple of years. Have your founding principles changed or adapted since the company’s inception? There was no grandiose vision or plan when we rented a garage space and started roasting. We were two (soon to be three) people with good intentions and integrity, short on experience, hungry to be self-sustaining. But, we knew we had found our right place in coffee—never underestimate the power of knowing you are where you should be. The Guatemala trip introduced the notion of being part of a coffee chain. Also, concepts of social justice and sustainability were getting some industry traction. The 2000 San Francisco coffee conference's theme was "Quality, Sustainability & Social Responsibility"—pretty radical back then for a trade organization. As a local roaster, I was invited to sit on the conference planning committee. It was an exciting time. Paul Rice (Fair Trade USA founder), Paul Katzeff (Thanksgiving Coffee founder), Kimberly Easson (Fair Trade advocate) brought vision to the committee—when the right messengers have the microphone at the right moment, hearts and minds will follow. Accordingly, we became the first California roaster to become a Fair Trade-certified purveyor. Henceforth, we based our buying practices on the fair trade model. It is not hard to do the right thing in business if one has a modicum of awareness. Medical coverage and profit-sharing was baked into our model, even during low-profit years. The concept of added value in business is here to stay, as reflected in the growth of certified B Corps (benefit corporation). Our VP, Maureen McHugh, received her Green MBA and turned her sights on the business with the vision and mission to ensure that we joined the burgeoning B Corp movement. We already had many good practices in place for the auditing phase of certification. Compliance involved scrutiny of all aspects of our business: how we treat employees, our sustainability steps, our social initiatives, our buying practices, our relationship to our communities. What does your day to day look like at the company? I've joined the industry elders, so, my role is now one of oversight. I have passed the operational baton to a new generation, which feels totally right. What's it like in the Bay Area these days, with all the competition? Invigorating? Scary? Both. One has to have retail to be relevant. Invigorating because of the energy and voices of smart young coffee professionals who are determined to create a more inclusive coffee culture. I could not have imagined 10 years ago being the out LGBTQ-owned business we now are. Can you tell me about Finca Sophia? In 2007 the idea of growing coffee took root—it became the ultimate glittering prize. What coffee careerist is not transfixed by the sight of coffee trees on the mountainside? We convinced ourselves that we must pursue this idea and close the loop on our coffee experience, otherwise our careers in coffee would lack an essential element. We started looking in Costa Rica and Panama for planted farms of 10-20 hectares with good altitude (at least 1600 meters). Our friend Willem Boot (of Boot Coffee) had already bought a parcel in Boquete (La Mula) in Panama and mentioned an unplanted piece of land at 1900-2000 meters in Cerro Punta. We went there, walked the 19 hectares (4 is protected rainforest reserve) and decided to buy it. Willem soon became our partner in the purchase and thankfully shared the expense of farming which we vastly underestimated. It has been a 10 year project. Our goal was to grow one of the best coffees in the world. This crazy, hubristic, quixotic idea somehow worked out. Where do you see Equator going in the next ten years—more cafes, wholesale, farming etc? A few more cafes, being a good launch pad for generations of coffee pros, and testing ways to connect with our retail communities. Chido Govera, who worked with coffee communities to teach them to grow edible mushrooms from coffee waste. David Griswold, (founder of Sustainable Harvest) who created a coffee import model that nurtures direct trade relationships. Dan Sibomana, who works in Kigali as a barista and roaster, for the good will he exudes and the sheer joy he takes in being one of coffee's ambassador. A deep bow to the members of IWCA (International Women In Coffee Alliance) who make sure that the voices of women in coffee are counted. What is your favourite brew method and coffee origin? A cone pour-over. Panama (slightly biased). My thanks to Brooke for taking the time to speak with me. She can be found on Twitter @kaffeo.